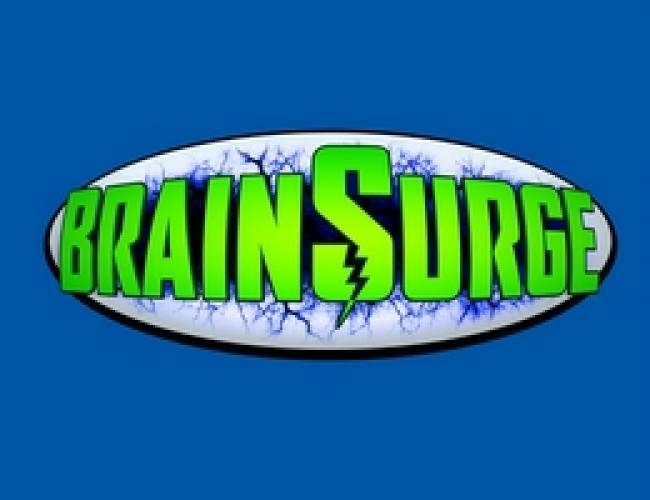 BrainSurge is an American children's game show that aired on Nickelodeon and was hosted by Jeff Sutphen. The show taped its first season in February 2009, and debuted on September 28, 2009. The show's format was adapted from the Tokyo Broadcasting System game show Brain Survivor. The U.S. version was created by Scott A. Stone and Clay Newbill, executive producer of The Mole and Shark Tank. BrainSurge was taped at Hollywood Center Studios in Hollywood, California. The series premiered on Discovery Kids in Latin America and Brazil on November 7, 2011; the Spanish show title is Veloz Mente. The contestants/teams begin by playing a series of visual puzzles. There were six(sometimes 5) puzzles in season 1, worth 10, 20, 30, 40, 50, and 100 points each (for a maximum of 250 points); in season 2, the 40-point puzzle was dropped (except in an episode that was delayed from season 1); in season 3 (Family BrainSurge), there are four puzzles, worth 10, 25, 50, and 100 points. Each solution is a number that the players need to enter using their keypads. The contestants/teams have 10 seconds to lock in their answers. The four highest-scoring contestants/teams advance to the next round (ties are broken by how quickly the contestants/teams entered their answers; if the teams tied for last place had a score of 0 points in season 3, a tiebreaker puzzle is played instead and the team who correctly answers it the fastest will advance); all eliminated contestants/teams in this and future levels are sent down the "Brain Drain", a slide formed as a human ear containing foam. During the second round, the four remaining contestants/teams are told a story from a book read by the host and are asked questions in turn about the story. Contestants/teams lock in their answers by sitting down on a chair. 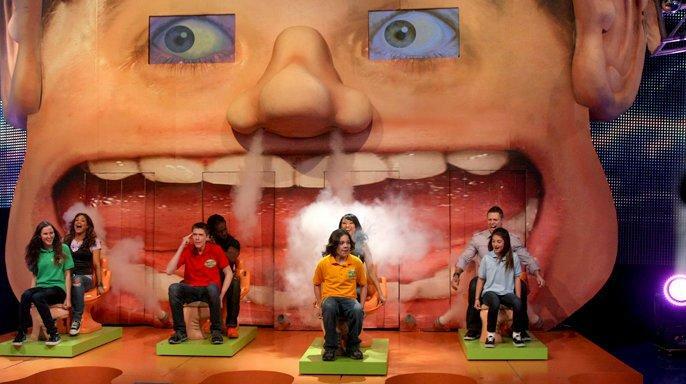 If a contestant/team gets a question wrong, the chair makes a farting noise, and the contestant/team is pulled backwards through a paper "tooth" (Curtains in Season 2 or later) of a large face (made to resemble host Sutphen) and eliminated from further play. This continues until two contestants/teams remain. In Family BrainSurge, each team is allowed one "Brain Fart", which allows two other members of the family (the "Brain Trust") to offer an answer for the team; the team stays in the game or is eliminated based on that answer. There were two types of questions used in Level 2. One type involved who, what, where, when, and why type questions about events in the story (in this type, if a question is missed the next player/team will be asked the same question) and the other type involved players/teams naming things that Jeff listed in the story (e.g. name the musical instruments mentioned in the story) and in this type repeating an already said answer, including another form of that answer, counted as a wrong answer. On "Family BrainSurge", if all the answers in the naming type questions are used up before two teams are eliminated, then Jeff will ask tiebreaker questions using who, what, and where type questions, and teams cannot use their Brain Farts during a tiebreaker (any unused Brain Farts are out of play when the tiebreaker starts). In the Knockout round, the two remaining contestants/teams have ten seconds to memorize a grid of 16 numbers containing 8 pairs of images from the story. The contestants/teams then take turns matching pairs of images from the story. Once either contestant makes a mistake, the player who makes the next match wins the game in a sudden-death match. At this point, the contestant/team that lost in this round and the 2 eliminated contestants/teams from Level 2 all go down the Brain Drain. For the bonus round, the contestant/team must successfully trace out three paths on grids within 90 seconds. The first path is six squares(5 squares on a season 1 episode) on a 4x4 grid, the second is eight squares(10 squares on two season 1 episodes and 9 squares on a season 2 episode) on a 5x5 grid, and the third is ten squares on a 6x6 grid; squares are always connected (horizontally, vertically, or diagonally). Each square has an actuator in the middle that must be stepped on to activate the square. Contestants see each path twice; the clock starts running when the contestant first activates a square. After completing a path successfully, the contestant must step on an actuator outside the board to stop the clock. Contestants are told immediately when they make a mistake; they must return to the start and view the pattern again before being allowed to continue; when viewing the pattern after a mistake, the clock continues to run. On Family BrainSurge, the child did the 4x4 and 6x6 while the adult did the 5x5, and the rest of the team (including the "Brain Trust") was allowed to help guide the contestant. 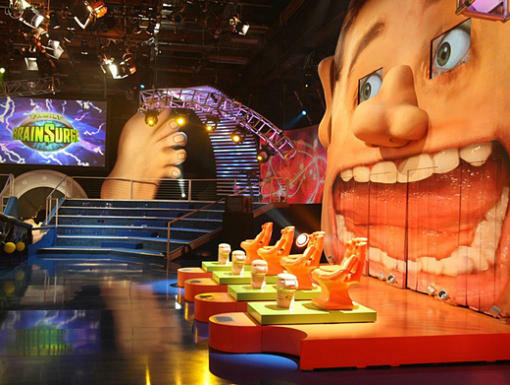 Contestants/teams can win three prizes, one for completing each of the three paths, with the grand prize usually being a trip (though on a celebrity episode of Family BrainSurge, it was a billiardstable); any prizes they win on one stage are theirs to keep, regardless of the final outcome. Contestants/teams who fail to complete all three boards must go down the Brain Drain, while contestants/teams who succeed are slimed, in network tradition. Also, on Family BrainSurge, the episode's winning team also got a donation made by the show's staff in their name to one of Nickelodeon's "Big Help" partner organizations.